One of the biggest drivers of the U.S. economy posted broad-based gains in January, which could ease fears following earlier indications that overall activity was slowing. However, a separate report on inventories still raises concerns about a bumpy ride. Retail sales last month increased 0.2% from December, beating many analysts’ expectations, according to a U.S. Commerce Department report released on Friday. December’s figure was revised upward from a 0.1% drop to a 0.2% gain. The January level is 3.4% better than activity from the same time in 2015, while total sales from November through January increased 2.5% from a year earlier. Excluding motor vehicles, sales rose by a still relatively modest 0.1%, but so-called “control” sales, which exclude motor vehicle dealerships, gasoline stations, and building material stores, rose by a stronger than expected 0.6% – more than erasing the 0.3% decline posted in December. Sales at online retailers increased 1.6% in January, due likely to a large snowstorm in parts of the country last month. As people were kept at home by the snow, sales of sporting goods, hobby supplies and those at service stations fell, while sales at restaurants and bars fell the most in two years. In contrast, sales of autos increased 0.6% and electronics gained 0.1%. Because of these factors, RBC continues to expect overall U.S. gross domestic product growth to strengthen to potentially more than a 2.5% rate in the first quarter of the year. If it does, this would be far stronger than the rate in the final quarter of 2015, when it increased at an annual rate of 0.7% in the October through December period. Despite the improvement in retail sales last month, consumers are surprisingly less upbeat this month, according to a University of Michigan survey. Its Index of Consumer Sentiment fell 1.4% this month from January's final reading and is down nearly 5% from a year earlier, according to preliminary numbers, lower than a consensus estimate from a panel of economists and hitting a four-month low. The small early February decline was due to a less favorable outlook for the economy during the year ahead, while longer-term prospects for the national economy remained unchanged at favorable levels, according to the report. 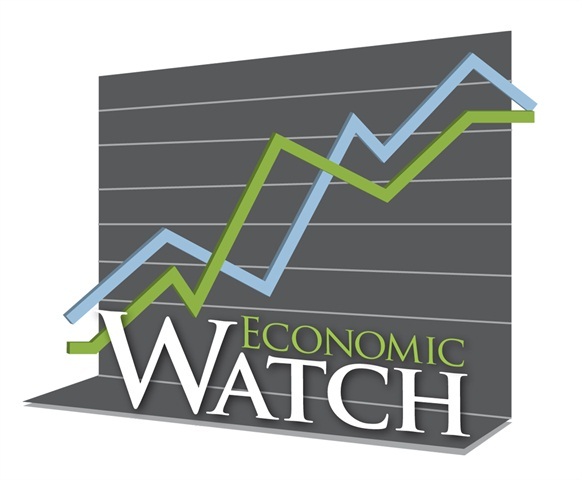 “While slowing economic growth was anticipated to slightly lessen the pace of job and wage gains, consumers viewed their personal financial situations somewhat more favorably due to the expectation that the inflation rate would remain low for a considerable period of time,” said Surveys of Consumers Chief Economist Richard Curtin. "Indeed, consumers anticipated the lowest long term inflation rate since this question was first asked in the late 1970's. "No one would have guessed 40 years ago, when high inflation was the chief cause of pessimism, that consumers would someday base their optimism on ultra-low inflation transforming meager wages into real income gains." Despite the downturn in the readings, Curtin said the data show consumers can be expected to increase their spending by 2.7% this year. Meantime, a separate report from the Commerce Department, also released on Friday, showed U.S. business inventories increased in December. The inventory to sales ratio hit its highest level in more than six years. Inventories increased 0.1% from November, which saw its level revised to a 0.1% decline following an originally reported 0.2% drop. This measure, which is used in part of the federal calculations for GDP numbers, could result in its overall performance for the final quarter of last year being revised downward, which would mean the economy did worse than its anemic expansion. According to a Reuters news report, record inventory accumulation in the first half of last year outpaced demand. This left businesses stuck with unsold merchandise and little incentive to order more goods and contributed to a sharp downturn in manufacturing, which resulted in some trucking companies reporting lower fourth quarter earnings. Also, recent reports show that manufacturing has continued falling into 2016. However, there is an expectation of the manufacturing drag on the economy may soon go away, according to comments from one analyst accompanying a report that measures the number of freight shipments and expenditures each month. The bottom line, while things appear to be getting at least marginally better, economic growth in the near-term ain't going to be smooth or pretty.